Completely Stunning custom built home in the Heart of Ann Arbor just minutes to the University of Michigan. You will be amazed by the back yard setting at this truly impressive home. Enjoy you own water front oasis from the large deck, attached patio, and water front patio plus spectacular views from every room in the house. The interior is showpiece of Design, Materials, and Craftsman built to the highest standard. 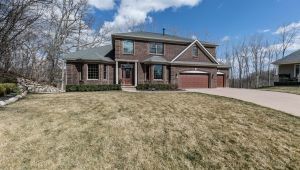 Highlights include two story Great Room with fireplace and walls of glass, open concept kitchen with cherry cabinets, granite, and SS appliances, main level den with built-ins, and great mud-room with family built-ins. The 2nd level features a luxury master suite with spa-like bath and huge walk-in closet, 2nd bedroom with private bath, and bedrooms 3 and 4 with jack-n-jill bath. The finished walkout lower level is spectacular including rec room with fireplace, full kitchen, additional play-room/home office, exercise room, 2 bedrooms, and 1.5 baths. You will love this home.